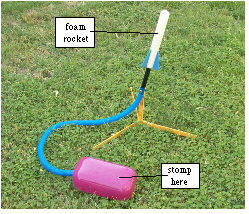 My all-time favorite science ”toy” is the Stomp Rocket. Slip a hollow foam rocket onto the launch tube, stomp on the plastic bladder, and, with a loud “pop”, the rocket will reach a height that will amaze both you and the kids. All you have to do is launch one rocket and get out of the way. The kids will take over. Kids get so excited stomping rockets that I made myself the Range Safety Officer. I won’t let anyone stomp a rocket until everyone is a safe distance from the launch tube. Two of our grandsons, John and Andrew, live in Belgium (dad is an officer in the United States Air Force and mom is studying music at the Master’s level). John, the oldest, is not yet in Kindergarten. By the time kids enter Kindergarten, they have developed an operational understanding of the physical world. They already know about “forces” and how forces influence “motion” (perhaps “bump” is a better word than force and “run” is a better word than motion). What they don’t yet have (or need) is a scientific vocabulary to talk about their experiences. John was recently found (caught?) 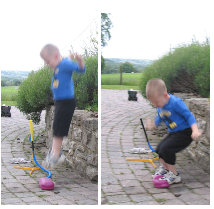 jumping from the high ledge of a driveway planter onto the bladder of his stomp rocket. Without help from us, John had worked out the relationship between the height from which he could jump and the height reached by the rocket. He figured out that there is a direct correlation between the two! Here’s a sequence of still pictures that show John stomping his rocket. As John sets himself up to jump, that boyish look in his eye makes me glad he doesn’t have a nearby barn roof to jump from. After absorbing the landing shock, he straightens to see how high the rocket flew. 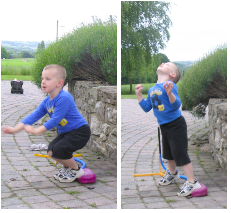 As is often the case with boys and their toys, a scuffed or hurt knee is the price paid to reach the outer limits. At a later point in time, when John is in middle school, we will get out the old stomp rocket (or better yet, buy a new one), stomp off a few, and then talk about force, impulse, potential energy, kinetic energy, pneumatics, and all of the other science concepts demonstrated (in the real world and not just in a book) by using a stomp rocket. We can even use a bit of mathematics to measure and compute the height reached. Thanks to mom and dad for taking the pictures and sending them on to grandad, grandmother, and all of you readers. My two year old loves this science toy, a great way to use energy! !